Who Has It More Right The Tea Party Or Occupy? Ever wonder why the Tea Party and Occupy movements sound so much alike at times yet at other times they sound so very different? Well I certainly have and despite thousands of Tweets, Google+ Posts, and Facebook comments later I was still a bit confused. That was until I saw the graphic above on Facebook that brought the matter into the proper frame for discussion. A discussion that I hope to generate over several posts on this topic. The long of the short of this is that it seems that both groups have a huge problem with the power that corporations have gained over our central government. The result is regulations that are favorable to the very entities they are purported to curb. This is nothing new and the solution to it has been debated for years. Each depending on what one considers to be the root of the problem. 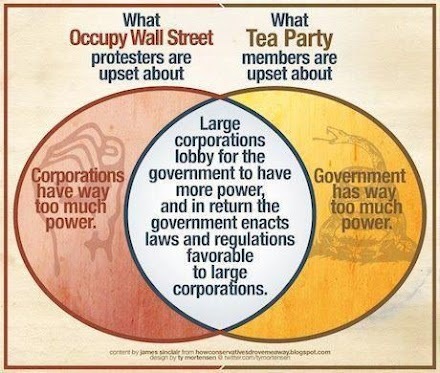 As the chart above clearly shows, the Tea Party believes it is that the central government is too powerful and Occupy believes that it is that the corporations have too much power.